G.I. Joe Universe G.I. 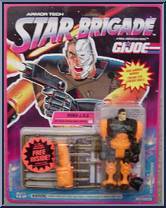 Joe - Classic Collection Series 12 - Star Brigade - Armor-Tech Robo-J.O.E. Greg Scott-a scientific engineering genius-was working in his laboratory one night on top-secret plans for Robotic Battle Armor suits needed to fight Cobra in space. Suddenly the lab was raided by DESTRO who managed to capture some of the plans and fatally wound the young inventor-leaving him a shattered shell of a man. G. I. Joe scientists used the remaining plans to rebuild his broken body, and ROBO-J.O.E. was born with a permanently integrated bio-armor space suit linked with silicon wires, computer chips, and muscle tissue! 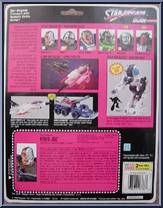 Now this powerful half-man/half-robot fights along side his Star Brigade teammates seeking justice and revenge on Destro. He doesn't design Robotic Battle Armor anymore; he IS it!" Contribute pictures, update details or suggest corrections for Robo-J.O.E..
Write a review about Robo-J.O.E..